Corradine Fonts’ Bestsellers is a decade worth of fonts with 30 bestsellers types offered by, obviously, Corradine Fonts. This bundle gives you access to the elegant Almiar Pro, humanistic Corradine Handwriting, to hulking Bloque, art-deco inspired Emblema, and modern Tecna. 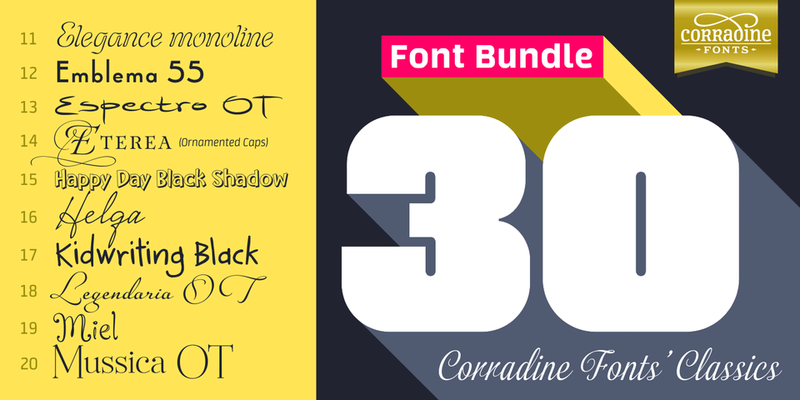 Get inspired by Corradine Fonts’ Bestsellers! A font description published on Wednesday, November 16th, 2016 in Active, Bundles, Corradine Fonts, Fonts, Manuel Eduardo Corradine by Andrei that has 2,708 views.